MANILA, Philippines - The main event of the 2016 PBA All-Star Weekend, the exhibition game between the North All-Stars and the South All-Stars, is happening today, August 7 at the Smart Araneta Coliseum. Twenty-four of the best players will face off in an exciting match in this year's All-Star Game. TV5, the official broadcast partner of PBA games will bring the coverage and livestream of this event starting 5:00 p.m. Sunday. Calvin Abueva and All-Star MVP Terrence Romeo, who have prevailed in the last year's game will headline the North All-Stars starters. The team also includes Marc Pingris, Mark Caguioa and Japeth Aguilar. Completing the North lineup are reserves Jayson Castro, Ranidel De Ocampo, Troy Rosario, Alex Cabagnot, Gabe Norwood, Paul Lee and Stanley Pringle. The South All-Stars who will try their luck to bounce back this year is composed of starters June Mar Fajardo, Asi Taulava, Joe Devance, James Yap and Scottie Thompson. Also part of the South squad are JR Quiñahan, Jeff Chan, Jericho Cruz, Chris Ross, Mark Barroca, RR Garcia and Carlo Lastimosa. Yeng Guiao, coach of the Rain or Shine Elasto Painters, and Leo Austria, coach of the San Miguel Beermen, were selected as the North and the South head coach, respectively. The rosters for the All-Star Game were chosen in two ways. The starters were chosen via a fan ballot (online and at the venue during PBA games). Players are assigned to represent the North or South All-Star teams based from their place of birth. Players born in Luzon are assigned to the North All-Stars team while players born in Visayas and Mindanao are assigned to represent the South All-Stars. If the player is born outside the Philippines, the player is assigned to his parents' birthplace. Two guards and three frontcourt players who received the highest vote were named the All-Star starters. 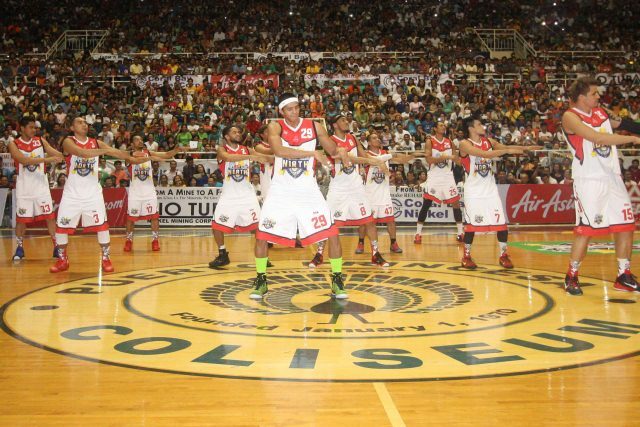 The reserves are voted by the twelve PBA coaches after the results of the fan ballot are released.